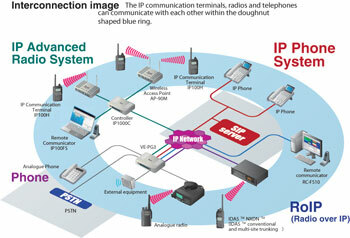 Icom's IP Advanced Radio System is a communication system that uses Wireless LAN access points. You can easily expand communication areas by only adding wireless LAN access points. Therefore, you can use this system in buildings (to communicate between lower and upper floors, places where it is difficult for signals from a transceiver to penetrate).